ICORD is pleased to offer two paid summer positions for indigenous high school students (finishing grade 10 or 11) to learn about SCI research. Students will have the opportunity to do small projects in a variety of labs at ICORD, and explore the exciting world of SCI research. In the summer of 2018 we were joined by Eliana Bond from Burnaby South Secondary. You can read more about her experience at ICORD in the Summer 2018 ICORDian newsletter. Eliana presented her research poster at ICORD’s Annual Research Meeting last month, and won an honourable mention in the Undergraduate poster competition. This year’s program runs July 8 to August 16, and pays $14/hour (5 hours per day). Applications will be accepted until 5pm on April 5. For more information, please call 604-675-8844 or send us an email. 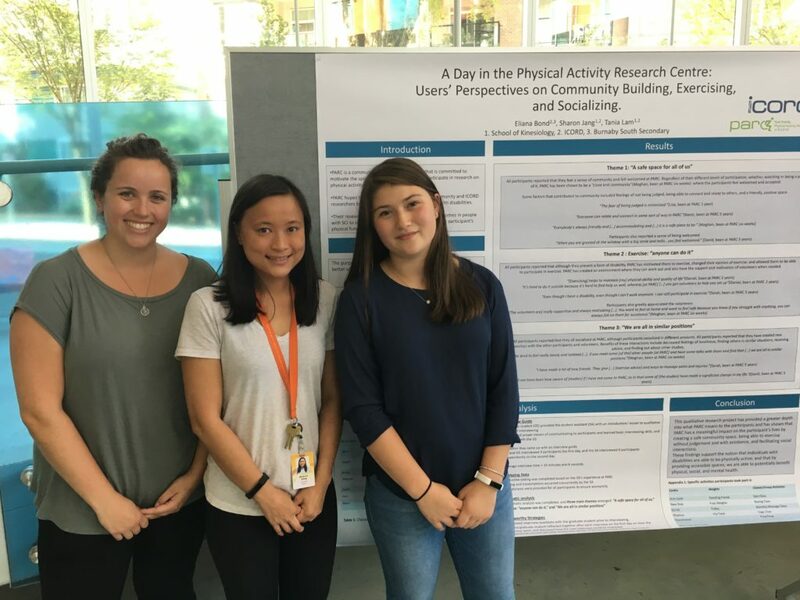 Eliana (right) with Sharon Jang (centre) and Ali Williams, at Eliana’s poster presentation on August 17.